Global Himalayan Expedition (GHE) leverages tourism to improve livelihoods through education, access to power and light, as well as revenue-generating activities. GHE leverages tourism and solar power to bring sustainable energy, digital education, wireless connectivity and livelihood creation to remote villages in Ladakh, one of the most elevated and coldest inhabited regions of the world. Specifically, GHE organizes leadership expeditions to and homestays in these remote locations, where participants, as part of their trip, contribute with funding and help set up micro-grids running on solar power. The region has ideal conditions for solar panels, with abundant sunlight due to the altitude, and clean and thin air. Over 100,000 villages in India remain in the dark, relying on unsustainable and polluting kerosene lamps and diesel generators. All the people living in these villages live below the poverty line and can only sustain their basic livelihood from the crops they grow and animals they rear. The remoteness and harsh terrain makes connection to the country’s conventional power lines unfeasible. Government agencies have electrified some villages and distributed solar chargeable lights, but the provision is insufficient for aspirational electrical loads and proper coverage. The lack of access to reliable light and power poses both safety concerns and hinders economic development. The micro-grid solution used is based on Direct Current (DC) technology, an efficient design for de-centralized power generation. The model is self-sustaining as the micro-grids are community owned with the villagers paying monthly rental charges to finance maintenance and scalability. Thus, once tourists have provided initial funding and support in setting up the system, it can operate more or less independently. The grids’ contributions are three-fold; i) sustainable solar power and energy efficient lights; ii) access to internet technology and digital education; iii) income generation through promoting village home stays and marketing of local village products. 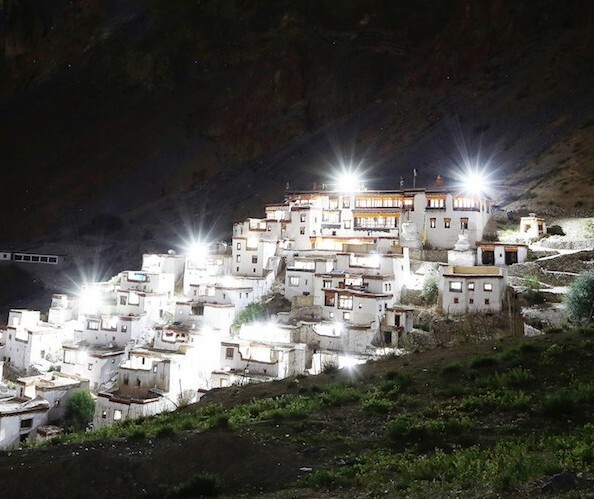 Since GHE began its pilot model of solar energy micro-grids in 2014, it has electrified 25 villages and organized 15 homestays in the region of Ladakh, impacting more than 15.000 villagers. GHE currently has 8 full-time employees, and employs 35-40 contract staff to run expeditions, village surveys and install solar grids. GHE are also promoting digital literacy and access to knowledge, and introducing low-power computers, energy-efficient LED monitors and satellite connection for internet access. Recently, GHE has started Mountain Homestays, an initiative that enables the electrified villages to generate income from tourism and local products.